China, a country of long history - over 5,000 years of civilized history - and big territory, is a country also famous for its diverse culinary tradition. Because of its vast region and dynamic climate, a variety of cuisine was developed in its long history. As Chinese culture considered cooking an art and a science, Chinese food has occupied one of the most important aspects of Chinese culture. Also, two of the most important Chinese philosophies - Confucianism and Taoism - also greatly influenced Chinese culinary tradition. This paper studies of Chinese food before the modern era - before the Republic of China. The paper will focus on how this rich culinary culture has developed and influenced food of each dynasty. Also, we will look at the characteristics of 4 greatest cuisines of China - Cantonese, Sichuan, Shandong and Huaiyang - and see how they differ. Confucius emphasized the delight that food can bring to us. He showed people how they could cultivate their palate and delight their senses. (1) Culinary etiquette, social sharing of food, presentation and combining of tastes and textures were important in this school. (2) The culinary standards and table etiquettes set by Confucius are still regarded basic rules in China today. Such small but unique things like cutting food into appropriate one-bite size so that one doest need a knife on the table was due to these rules. To Chinese, food was important for its function of bringing ¡®harmony¡¯ between people, and therefore took it improper not to prepare food when meeting other people. Also, Confucius taught that while maintaining the integrity of the individual food it is important to blend taste and textures and the use of condiments to give the palette the whole experience. (3) Color and aroma was equally important. Confucianism, therefore, elevated cooking to a level of art in the Chinese history. Taoist thought focuses on health, longevity, immortality, wu wei (non-action) and spontaneity. (4) Thus, Taoism influenced Chinese cuisine of development of hygienic aspects of food and cooking - due to the longing for longevity. In contrast to supporters of Confucianism who were interested in the taste, texture and appearance, Taoists were concerned with the life-giving attributes of various foods. (5) Therefore, Taoism induced Chinese to study the physical and psychological effects including nourishment of each ingredient and cooking method. It concerned itself with the nourishment of the body, prevention of disease and the search for longevity. (6) During the studying process, Chinese found out culinary and medicinal purposes of many plants, roots, fungus and seeds. These contributions of Taoists have resulted in traditional vegetable-based low calorie foods with little fat. During the Zhou Dynasty, the agricultural technique progressed a lot, making agricultural food products to be the main source of food to Chinese. China began growing the five cereals - soybeans, rice, wheat, proso millet, and foxtail millet - as food crops during the Zhou Dynasty. The economy flourished during the Zhou Dynasty, and it resulted in abundant cereals, vegetables and meat. The cereals available included rice, corn, millet and beans. The Book of Songs states there were in excess of 130 plants, which included more than 30 kinds of common vegetables. (7) Fruits and nuts included peach, plum, apricot, date, wild jujube (Chinese date), chestnut, hazelnut, pear, sweet crabapple, persimmon, melons, cherry, orange, tangerine and shaddock (a fruit similar to a grapefruit). (8) Over 100 animals including ox, sheep, dog, pig and horse were accessible during the era. Birds such as chicken and goose were also in use. Cold-blooded animals - turtle, snake and shark - were used, too. During the Han Dynasty, millet wine became very popular and people started to make noodles out of wheat and rice. Chinese imperial food originated around the Zhou Dynasty (11th century B.C. - 476 B.C.). (9) Although China¡¯s dietetic culture developed and grew prior to the Zhou Dynasty, it truly flourished during the Zhou, Qin, and Han dynasties (1122 B.C. - 220). (10) During the Zhou Dynasty, a complete system for imperial food was developed. It included procurement and diets preparation. Everything was done in a fixed order according to the "eating rules." The Zhou Dynasty imperial food was of a higher standard than the imperial food of the Xia and Shang dynasties. Foods were plentiful and many imperial and famous dishes were developed. The six cereals included rice, millet, broomcorn, sorghum, wheat, and wild rice stem. The six animals were the horse, cow, sheep, pig, dog, and chicken. The six clears were water, thick liquid, li wine, chun wine, yi wine, and ye wine. The 120 delicacies referred to all the delicacies the emperor ate. (11) By Han Dynasty¡¯s strengthened economy and its cultural exchanges with other countries had provided new sources of raw materials, better cooking utensils and cooking skills, wider adoption of ironware, and higher standards for imperial dishes. (12) Also, famous Chinese tea is known to have begun since 10th century BC in Han dynasty. The dynasty used tea as medicine (12a). After the Han Dynasty, thick soup became an important food. Another change was that roasted or baked meats were not eaten with cooked rice. The technique of using fermentation to make staple foods, such as steamed buns, stuffed buns, and steamed cakes, which are still popular foods today, was already being used in the final years of the Han Dynasty. (13) Other staple foods were baked cakes and noodles. During the era of Six Dynasties in the North region, people mainly ate millet, meat and dairy products. However, in the South region, because of the appropriate climate, rice dominated wheat and barley. Southern cuisine had a greater variety of food including diverse vegetables and fruits - they even ate frogs and snails, which northerners didn¡¯t eat. In the Sui Dynasty, as the government was interested in the development of agriculture - especially grain - the consumption of grains was increased. The Tang Dynasty is referred to as 'the Golden Age of China.' However, this name isn't applied to China's cuisine. In Tang Dynasty, the most important staple food still was millet and wheat, while people in the South preferred rice. Much vegetable was preserved by using pickling method. Eastern crops such as sugar beet, spinach, lettuce, almond and fig was introduced in this era. New milling methods were developed, and wheat was turned into flour and dumpling skins. Therefore, new food such as dumplings, wheat cakes, fried dough strips and noodles became popular. (15) Since the dynastic family was of part-Turkic background, foods like cream, yogurt, kumys (fermented mare's milk), cheese, curds and butter emerged into China. (16) Tea, which is regarded as one of the national drink of China, was introduced to China by a Buddhist monk and gained popularity. Imperial food of Tang Dynasty was similar to that of Sui Dynasty. A Staple food of Song Dynasty was Salted Fish. In this period, rice became widespread and was the chief grain of China from then on. Chicken, and duck were popular but beef wasn¡¯t as popular because of the Indian influence. The vegetable eaten were: cabbages, onions, garlic, spinach, turnips, radishes, cucumbers, gourds, eggplants, cresses, carrots etc. (17) Common fruits included apples, mulberries, jujubes, litchis, tangerines, mandarin oranges, apricot, peach, plum, chestnut, walnut, foxnut etc. Tea which was introduced in previous dynasty became the necessity of every household. Sugar was frequently used to preserve foods - sweetmeats and candies were thus used. Also, Tofu was invented in this era, probably by the bean milk preserved with sea salt. In Yuan Dynasty, Mongols controlled China. Therefore, a lot of new foods were introduced into China. Food gained more Central Asian, Mongolian, Manchurian and Muslim food flavor. Because of this Mongol influence, dairy products like cream, butter and kumys became popular. Also, peanut and corn was introduced to China in this era. The imperial food of this era is not that different from that of Ming, Qing Dynasty and the food we eat today. Shandong Cuisine, commonly known as Lu cuisine, is a native cooking style of Shandong, an Eastern coastal province of China. The cuisine consists of two major styles. Jiaodong style is characterized by dishes using various kinds of seafood with light taste. 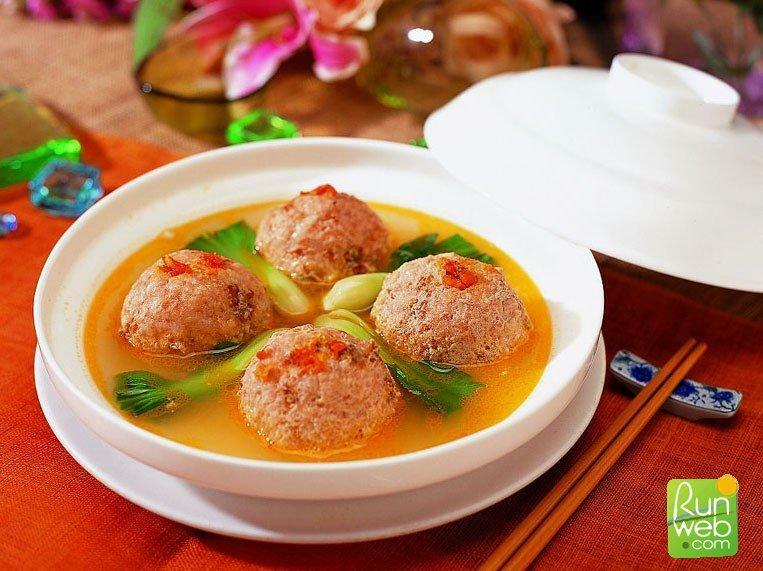 Jinan style is famous for using soup as part of the meal..
Shandong cuisine is considered the most influential cuisine among all the others. 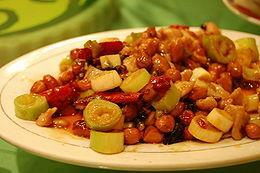 Shandong cuisine can be traced back to the Spring and Autumn Period (770-221BC). It was quickly split in the Southern (969-1279) and Northern Song Dynasty (960-1127), and was recognized as an important style of cooking in the Qing Dynasty (1644-1911). (20) Modern cuisines of Beijing, Tianjin and Northeastern cities are mostly influenced by Shandong cuisine. Many of typical dishes in China's households are prepared with simplified Shandong cuisine styles. 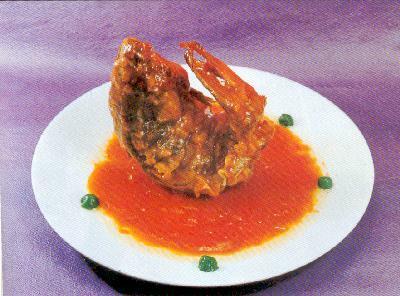 Some of the famous dishes of Shandong cuisine are Braised abalone, Sweet and Sour carp and Bree with a complex. The most common word used to describe the taste of lower Yangtze dishes is "delicate." 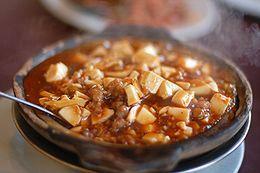 (27) Huaiyang cuisine emphasizes original flavor. Sauces are common, but seasoning is typically mild, with salt and sugar both used to accentuate flavors, which creates dishes usually richer and saltier than those of other regions, but less oily than Western Chinese cooking. (28) Soy sauce, vinegar and rice wine are commonly used for flavoring. The dishes usually are colorful with sweet taste. Ingredients frequently used in the cuisine are pork, fresh water fish and other sea creatures. The cuisine is also famous for using good-quality vinegar, Chinkiang vinegar, produced in that region. Among various sub-cuisines of Jiangsu Cuisine such as Shanghai Nanjing, Suzhow and Wuxi cuisine, Huaiyang cuisine is the most popular, and therefore the name Huaiyang is commonly used to represent the whole Jiangsu cuisine. Nanjing cuisine emphasizes even taste and harmonic color. It is famous for its river fish, shrimp and duck. Suzhow chisine has a stronger taste than Nanjing cuisine and is sweeter than other cuisine, characterizing Huaiyang - Jiangsu - cuisine. It is also noted by the emphasis on the selection of fresh material. Contrast to that of Sichuan, dishes of Huaiyang cuisine usually has sweet flavor. Spiciness almost never appears in this cuisine. Cantonese cuisine originated from Guangdong province located in Southern China, especially from Guangzhou (or, Canton.) Cantonese Cuisine is well known not only in China but also in various foreign countries - actually, most Chinese restaurants abroad serve Cantonese food. Because Guangzhou is a great port, a variety of ingredients were accessible. Also, because of its temperate, tropical climate and abundant rainfall, a variety of vegetables and fruits were accessible. Along with pork, beef and chicken, almost all edible meats including organs, chicken feet, duck tongues, snakes and snails were used. This is shown well in Cantonese proverb, "Any animal, whose back faces sky, can be eaten". The freshness of ingredients is emphasized, and thus just modest amount of spices are used. Cantonese sauces are light compared to thicker and richer sauces of other Chinese cuisines. Spring onion, sugar, salt, soy sauce, rice wine, corn starch, vinegar, sesame oil, and other oils suffice to enhance flavor in most Cantonese cooking, though garlic is used heavily in some dishes, especially those in which internal organs, such as entrails, may emit unpleasant odors. (34) Ginger, chili peppers, five-spice powder, powdered white pepper, star anise and a few other spices are used, but often sparingly (35) Some famous Cantonese sauces are Hoisin sauce, Oyster sauce, Plum sauce and Sweet and Sour Sauce. 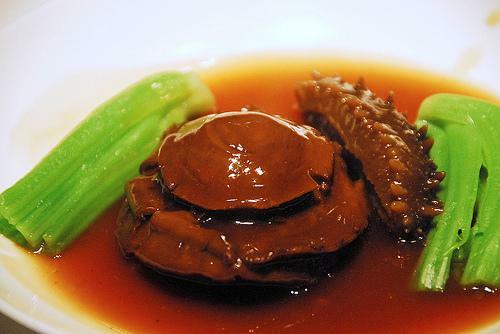 Although Cantonese cuisine accentuates fresh ingredient, it also uses a lot of preserved food. There are numerous methods of preserving these items, among which are drying, preservation and oxidation. Dried food is usually rehydrated before cooked. Some examples are fermented tofu, salted duck egg, dried cabbage, dried small shrimp and pickled Chinese cabbage. A number of traditional dishes of Guangdong including Chinese steamed-eggs, Cantonese fried rice, Stir-fried vegetables with meat, and Sweet and sour pork are widely served in Cantonese restaurants. Some of them are also found among Chinese homes, as they're not that complex. Some deep fried dishes include Zhaliang, Youtiao, Dace fish balls. Another notable Cantonese speciality is slow-cooked soup, or lo foh tong in the Cantonese dialect (literally meaning old fire-cooked soup). (38) There are Cantonese seafood soup, winter melon soup, Snow fungus soup and etc in this category. As Guangdong locates near Southern coast of China, various seafood sources are available. In Cantonese cuisine, steamed food are regarded the most high-status because it guarantees freshness of the ingredients. Therefore, abundant use of garlic or spices is not considered the best recipe. Cantonese noodles are sometimes served with dim sum. Other kinds of noodles include Yuanton noodle, Chinese noodles with fish balls, beef balls, or fish slices, Beef chow fun, or Shahe fen There are also other styles of food, Siu mei (cooking meat with no vegetables,) Lou mei (dishes made out of internal organs and leftover parts of animals,) Siu laap (Cantonese-style cooked meat including Siu mei, Lou mei and preserved food,) and Little pan rice (dishes served in a flat-bottomed pan.) These styles of food are usually made of diverse meats including pork, meat, duck and, for Little pan rice, tofu. Dessert of Cantonese cuisine is rather universal among other cuisines. Some of them are Red bean soup, Black sesame soup, Sai mai lo, and Sweet potato soup. Some of delicacies which are highly praised within China include Shark fin Braised abalone (bao yu,) Shark fin soup (yu qi tong,) Sea cucumber (hoi sam,) and Swallow's nest soup (yeen waw.) These dishes are highly expensive, due to relatively small supply of ingredients compared to high demand of them. Sichuan cuisine is a style of food originated from Sichuan Province of Southwestern China. The cuisine is famous for its spicy and bold taste which usually comes from frequent use of various chilies and Sichuan peppercorn. There are many sub-cuisines included in Sichuan Cuisine, among which the best known are Chonquing style, Chengdu stlye, Zigong style, and Buddhist vegetarian style. Today, Sichuan cuisine is not only characterized by its spiciness and strong flavor but also by varied smoked dishes and liberal use of oil. Also, the cuisine emphasizes texture obtained through processes of cooking. Some of the famous dishes of Sichuan cuisine include Ma Po Tofu (Stir-fried Tofu with Minced Beef in Spicy Bean Sauce) which is popular not only in local areas but also in abroad, Kung Pao Chicken, Tea smoked Duck and Twice cooked pork. China is a country with one of the biggest territories and longest history that exists today. Because of its vast land and diverse climate, a variety of crops and ingredients were available, and that is well shown in the range of cuisines - eight great cuisines and numerous branches - it has. Also, throughout China's long history in which there were numerous dynasties, we can see how China achieved its fame as the country of "eating anything with four legs except tables, and anything that flies except airplanes." Although varied depending on regional differences, China's culinary culture has constantly developed with adoption of new ingredients and changing society. It is indeed difficult to define food of premodern China into one word - or even a sentence. The culinary history and culture of China is totally different regarding which region or cuisine it is based on. It may even be appropriate to view Chinese cuisine as an integration of various distinct cuisines that have developed independently through a long time, rather than viewing it as a unified whole. However, they are also linked with each other in the name of "China", as seen in the attitude and thoughts towards food and eating based on universal philosophies such as Confucianism and Taoism. Therefore, this ¡°variety in union,¡± which notifies the diversity of Chinese cuisine in one universal philosophy, would be the most proper word that we can think of. (7) "The History of Chinese Imperial Food"
(12) "Introduction of Chinese Imperial Food"
(13) "The History of Chinese Imperial Food"
(17a) It is believed that maize made its way into China indirectly, by the way of South East Asia. See "Asian Footsteps of Maize"
(18) "Introduction of Chinese Imperial Food"
(24) [Image] "Braised Abalone with Sea Cucumber and Greens"
(26) [Image] "Yeung Chow Fried Rice"
(29) [Image] "8 Regional Chinese Cuisines "
(31) "Chinese Cuisine - Food"
(32) "Chinese Cuisine - Food"
(33) Wikipedia : "Cantonese Cuisine"
(34) "Chinese Cuisine - Food" (35) Wikipedia : "Cantonese Cuisine"
(36) [Image] Wikipedia : "Cantonese Cuisine"
(37) [Image] Wikipedia : "Cantonese Cuisine"
(38) Wikipedia : "Cantonese Cuisine"
(39) [Image] Wikipedia : "Cantonese Cuisine"
(40) "Chinese Cuisine - Food"
Note : websites quoted below were visited in May 2008.